Since 1989, "AIB News" is the news of the Italian libraries, which informs not only about the life of the Association, but also about what is happening in the world of libraries and information. Since 2009, it is published every two months and reports of public meetings, address books, short news on the most important events in the industry. Collaboration is welcome. Since 2011, "AIB News" is published online. AIB studi, formerly Bollettino AIB, is a four-monthly journal focused on Library Science and analysis of facts, published by the Italian Libraries Association (AIB). The journal, peer-reviewed and open access, is aimed at promoting theoretical reflection, methodological experimentation and professional practices within the field of library, documentation and information services. AIB studi has been listed by ANVUR as an 'A category' journal, it is indexed in Scopus, and in ESCI (Emerging Sources Citation Index of Web of Science). The journal also participates in DOAJ (Directory of Open Access Journals). Bibelot is the online and Open access newsletter of the Tuscan Section of the Italian Library. The bulletin intends to be an instrument of information and debate on everything regarding libraries in Tuscany. 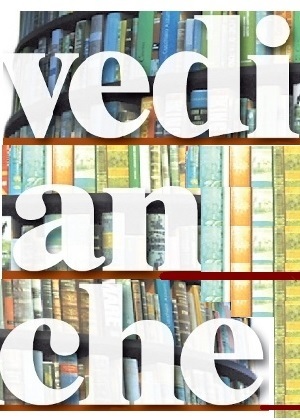 Vedianche is the online newsletter of the Ligurian section of the AIB, Italian library association. The pourpose of the Vedianche newsletter is to document the activities of the association, to inform about the world of ligurian libraries, and finally to present some original contribution in the LIS (Library and information Sciences) field. «Bollettino AIB» has been a journal published by Associazione italiana biblioteche. Starting from 2012 its name was changed into «AIB Studi. Rivista di biblioteconomia e scienze dell'informazione», a full text digital electronic journal. «Bollettino d'informazioni. Associazione italiana biblioteche» has been a journal published by Associazione italiana biblioteche (Italian Library Association) from 1961 to 1991. This series ended with issue nr. 3 of 1991. Issue nr. 4 of 1991 was never published. 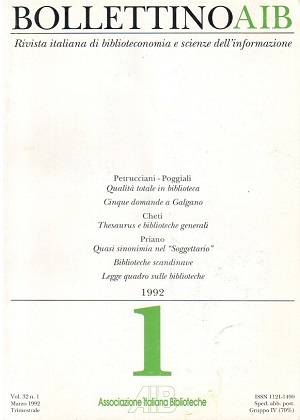 Starting from 1992 its title was changed into «Bollettino AIB. Rivista italiana di biblioteconomia e scienze dell'informazione». Digitalized version of issues ara available in the archive section. «Notizie AIB. 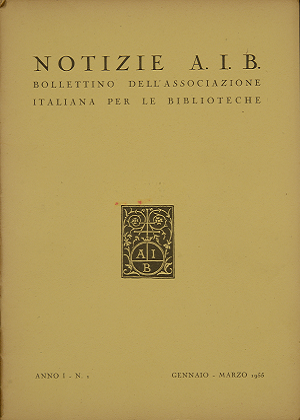 Bollettino dell’Associazione italiana biblioteche» has been a journal published by Associazione italiana biblioteche (Italian Library Association) from 1955 to 1959. This series ended with issue nr. 1/2 of 1959. Issues from mid-1959 until the end of 1960 were never published. 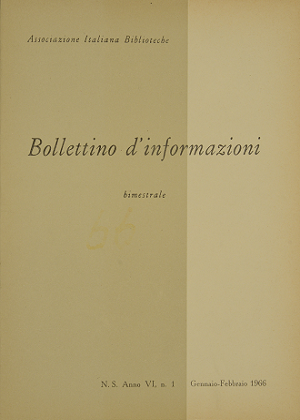 Starting from 1961 its title was changed into «Bollettino d'informazioni. Associazione italiana biblioteche».